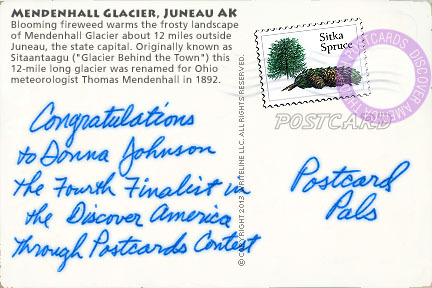 Here's the 4th Finalist and last entry in the 10th Annual "Discover America Through Postcards" Photo Contest, "Glacier Behind the Town." Thanks to Donna in Juneau for submitting it. 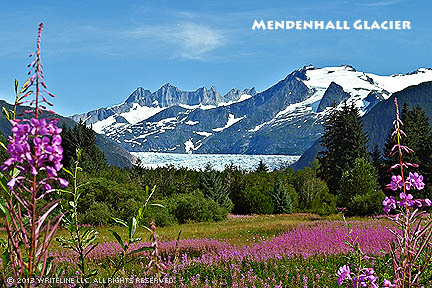 Blooming fireweed warms the frosty landscape of Mendenhall Glacier about 12 miles outside Juneau, the state capital. Originally known as Sitaantaagu ("Glacier Behind the Town") this 12-mile long glacier was renamed for Ohio meteorologist Thomas Mendenhall in 1892. Next week, you'll receive an email ballot to cast your vote for your favorite photo. Voting ends Dec. 6, 2013, 8:00 PM EST. All finalists receive the website companion book, Discover America Diaries. The Grand Prize winner receives the book plus $100 - just in time for the holiday season. See the official rules.